National Assisted Living Week is September 13th – 19th. This year’s theme is Nourishing Life: Mind, Body, Spirit. The Villages at Marion will kick off the celebration with our annual carnival on Sunday, September 13th from 1-3 pm on-site. There will be food, games, prizes, vendors, a bake sale, a cake walk, silent auction and much more. The celebration doesn’t stop there. 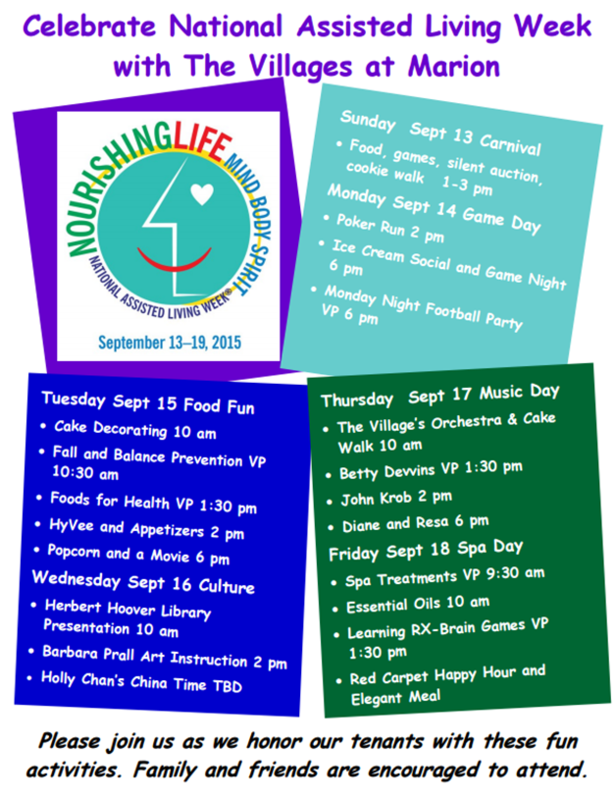 Each day we will be celebrating our tenants and staff with fun events relating to the theme Nourishing Life. Check out the flyer below for the full week’s schedule! If you see an event that you would like to participate in, please let us know by calling Amber or Brianna at 319-377-9808.